“90% of top 30 teams that participated in the India Innovation Challenge Design Contest in 2016 are from tier two and three cities. The number of students who continue to come up with innovative ideas that can be incubated to be market ready is only increasing,” says Sanjay Srivastava, director, Texas Instruments India University Program. 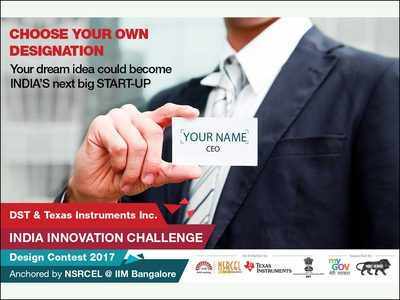 Texas Instruments (TI) and collaboration with Department of Science and Technology (DST) in collaboration with IIM Bangalore’s NS Raghavan Centre for Entrepreneurial Learning (NRSCEL) announced the India Innovation Challenge Design Contest 2018. DST and TI together are funding Rs 8.2 crores to support the qualifying teams, which includes seed funds of Rs 20 lakhs each to top 10 teams. “When we started with a similar competition on a smaller scale, only 109 students participated. But since we started the IICDC in 2016, we saw 11,000 students registering and in 2017, there were 15,380. They are from Arunchal Pradesh and Jammu and Kashmir and small towns from Kerala and Karnataka. We noticed that parents and students were unaware of the supportive ecosystem in metropolitan cities like Bengaluru where their ideas can take off into a product that can impact society in a big way,” he added. Anita Gupta, advisor and associate head, DST said the government is willing to invest to fund product developers and connect them with incubation partners. She also agreed that most of the winning ideas come from smaller towns in agriculture and social sectors. “But when the students come to IIMB NRSCEL and get business support systems and meet mentors, they benefit hugely. Also, such exposure increases the employability of students,” she told TOI.